**Our Ultimate Outsider stamp is located in the park office during office hours. Outside of that time, our stamp can be found at the park kiosk on the main entrance road. Lake Greenwood State Park is known locally as the host site for the South Carolina Festival of Flowers Triathlon held each June. In addition to hosting the annual triathlon, the park provides year-round opportunities for excellent South Carolina bass fishing, boating, and offers shoreline campsites and nature trails. The park was one of 16 built by the CCC and many of the original structures built by the work teams remain standing as fine examples of classic CCC architecture. 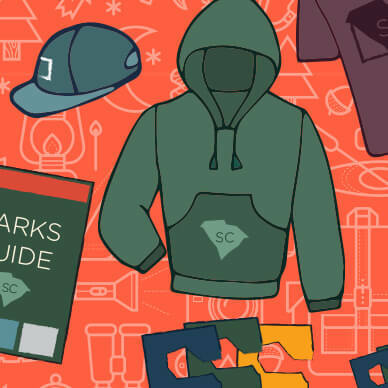 The history and contributions to all South Carolina State Parks are commemorated in an interactive exhibit at the CCC Museum in the Drummond Center. Come to Lake Greenwood State Park and compete in the annual triathlon or take a leisurely stroll on the nature trails and enjoy some great South Carolina bass fishing. If you’re fascinated by CCC architecture, you’ll enjoy more amazing historic structures in South Carolina State Parks, including one of the finest plantation homes of the South at Rose Hill Plantation State Historic Site and the only one of the historic lighthouses in South Carolina still open to the public at Hunting Island State Park.